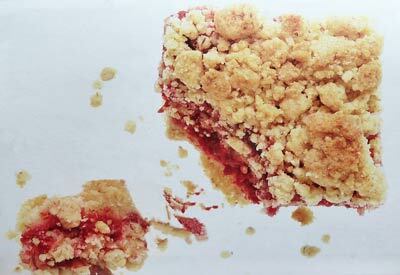 If you love the ease of cookie bar recipes and the sweet tart flavor of raspberry jam, you're going to love this Raspberry Bars/Squares Recipe. I tasted my very first raspberry square years ago in Maine while visiting the home of my Nana's best friend. It seemed that whenever you visited Aunt Leita, she had something delicious and just warm from the oven to serve. 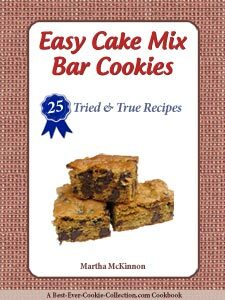 Requiring just a few pantry ingredients that I usually have on hand, this remains one of my favorite and easy 'go-to' cookie bar recipes. Another nice thing about this Raspberry Squares recipe is that you can vary the flavor by changing the jam you use—marmalade and apricot jam are two more of my favorites. Be sure to use a high-quality raspberry jam for the best flavor! And as always, be sure to read your recipe thoroughly to make sure to avoid any mistakes and ensure your have all the necessary ingredients. Position one of your oven racks in the middle and preheat the oven to 400F degrees. Grease an 8-inch square baking pan with shortening or non-stick cooking spray. Alternatively, for easy removal and cleanup, line your pan with foil and grease the foil. In a large bowl combine the butter and sugar with an electric mixer on low speed or with a wooden spoon. 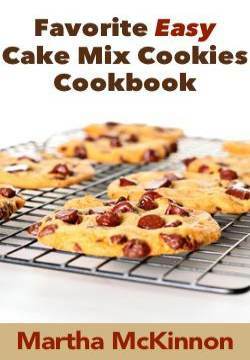 Stir in the flour, oats, baking soda, and salt, until the mixture becomes crumbly. Press half the mixture into the prepared pan. Spread with jam to within 1/4 inch of the pan's edges. Crumble the remaining oat mixture evenly over the jam and pat it down gently. Bake for 25 to 30 minutes or until lightly browned. Remove from the oven and cool completely. Cut into desired size squares or bars. This recipe makes one 8-inch square pan of Raspberry Squares. Would you like to try these bars with other flavors of jam? Go ahead! Have fun! Experiment! Let us know what you discover. 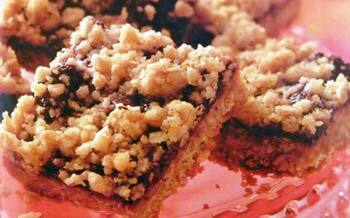 We are always on the lookout for new variations of our favorite raspberry bars recipe. We have enjoyed these delicious fruit-filled squares filled with apricot jam, cranberry apple jam, and mincemeat. I'm thinking they would be yummy with blueberry jam or orange marmalade too. Let your imagination flow and experiment with whatever filling sounds good to you. The bittersweet dark chocolate glaze goes perfectly with the chocolatey brownie sweetness. Cookie Tip: Did you know that you can buy seedless raspberry preserves? No more seeds getting stuck in your teeth! Position one of your oven racks in the middle and preheat the oven to 350F degrees. Prepare and bake brownie mix as directed on package for fudge-like brownies in a 13x9-inch baking pan. Let cool completely after baking. In a small bowl beat cream cheese, powdered sugar and preserves with an electric mixer on medium speed until smooth. Microwave chocolate and butter in a samll microwavable bowl on Medium (50%) for about 1 minutes or until mixture can be stirred smooth. Refrigerate about 1 hour or until chocolate is firm. This recipe makes one 13x9-inch pan of Raspberry Bars with Cake Mix. Position one of your oven racks in the middle and preheat the oven to 325F degrees. 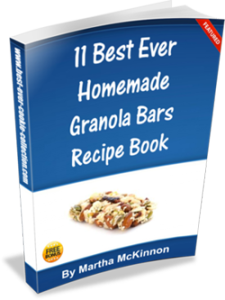 In a bowl, mix oats, flour, coconut, 1/4 cup sugar and salt. Add melted butter and stir until well blended. Press the dough evenly into a 13x9-inch baking pan. Bake for 15 to 18 minutes or until edges begin to brown. Let cool 5 minutes, then spread jam evenly over warm crust. In a large bowl, beat egg whites and cream of tartar with electric mixer on high speed until thick and foamy. Gradually add remaining 2/3 cup sugar and continue to beat until mixture holds soft, shiny peaks. 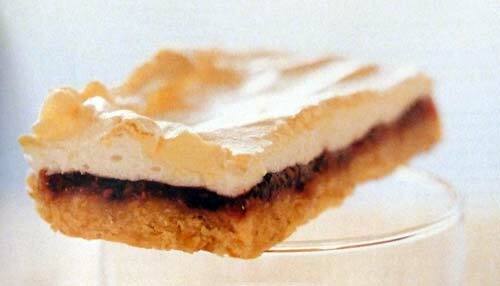 With a spatula, spread meringue evenly over jam. Bake until meringue is lightly browned, about 20 minutes. Let cool 5 minutes, then cut bars into desired size and shape. Let bars cool completely in pan on wire rack. This recipe makes one 13x9-inch pan of Royal Raspberry Bars. Preheat oven to 350F degrees (if using a dark or nonstick pan, preheat oven to 325F degrees). In a large bowl, mix flour, oats, brown sugar, hazelnuts and baking soda using a Pastry Blender . In a small bowl, reserve 2 cups of oat mixtuere for topping. Firmly press remaining mixture into bottom of ungreased 15x10x1-inch baking pan. Bake 15 to 18 minutes or until crust just begins to brown. Spread raspberry filling over warm crust. Stir cinnamon into reserved oat mixture. Sprinkle oat mixture over filling and press lightly into filling. Bake 20 to 25 minutes or until top is deep golden brown. Cool pan completely on wire rack at least 30 minutes. Cut bars into desired size and shape. 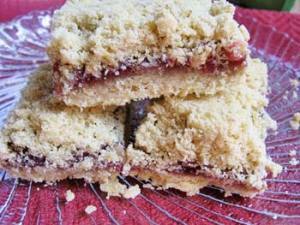 This recipe makes one 15x10-inch pan of Raspberry Crumb Bars. In step 5, bake for 18 to 21 minutes. In step 9, bake 25 to 30 minutes. Preheat oven to 350F degrees. Line an 8-inch square pan with parchment paper - allowing 1-inch overhang on two opposite sides. In a small food processor, process almonds until finely ground. In a large mixing bowl, stir together ground almonds, cornmeal, flour, sugar and salt. Stir in melted butter until well mixed. Press about 2/3 thirds of the dough into prepared baking dish. Scatter raspberries over crust layer and then crumble remaining dough over raspberries. Bake 35 to 40 minutes or until top is golden brown. Remove pan from oven and let cool completely on wire rack. Store bars in pan, wrapped tightly in plastic, at room temperature. This recipe makes one 8-inch square pan Raspberry Cornmeal Bars.